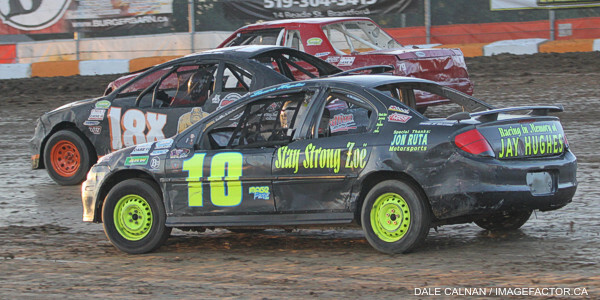 Ohsweken, Ontario – August 7, 2013 – Ohsweken Speedway’s championship chases enter their stretch drive as the 18th season of racing continues this Friday, August 9 when the Rochester Knighthawks present “Art Hill Memorial Night”. This week’s event features the Corr/Pak Merchandising Sprint Cars, Affordable Towing & Recovery Thunder Stocks, HRW Automotive Mini Stocks in the annual “Art Hill Memorial 42”, and Gale’s Auto Aftermarket Bombers, plus the rescheduled Thunder Stock B-Main and Feature from July 19. The Sprint Car standings have tightened up at the top lately, as Jim Huppunen had problems late in the Northern Summer Nationals and did not finish. Huppunen still leads heading into this Friday’s Ohsweken Shootout qualifier, but Mitch Brown has closed to within just 19 points, while Jamie Collard is just 4 points behind Brown. Shane Ross and Todd Hoddick hold the 4th and 5th positions respectively, with just over a month left in the season. The race for the Thunder Stock championship continues to be extremely competitive, with a new points leader seemingly taking over every week. Jim Lampman is now atop the list, but his lead is just 8 points over Cory Turner, and 14 over defending champ Mike Thorne. Bryce Richardson and Lee Winger round out the top 5, and are just 24 and 40 points behind Lampman, respectively. Extra points are up for grabs this Friday, as the Thunder Stocks will run the B-Main and Feature which were rained out on July 19, along with this week’s regularly scheduled program. The annual “Art Hill Memorial 42” is the biggest event of the season for the Mini Stock racers, with a feature race more than twice the distance of their regular races. The race honours Art Hill, who suffered a fatal brain aneurysm while competing in his #42 machine in a race at Ohsweken in 1999. Karl Sault won the 2012 Art Hill Memorial, but has moved to Thunder Stocks this season, leaving the door open for a new $1,000 winner. Mini Stock rookie Davey Boughton leads the Mini Stock standings heading into Friday’s race, with Jason Lungaro his nearest challenger, followed by Alex Schuts, Laura Hughes, and Robin Elliott. The Bomber division title continues to be closely contested, as Jesse McDonald has a slim 5 point lead over Tim DeBoer. Dusty DeBoer is 3rd, followed by Max Chechalk, and Brady Longboat. About the Rochester Knighthawks: A charter member of the National Lacrosse League, the Rochester Knighthawks lacrosse club is owned by Curt Styres. The Knighthawks claimed their second consecutive NLL World Championship on May 11, their fourth title in team history. The season begins in January 2014, and season tickets are on sale now! More information on the Rochester Knighthawks can be found at www.RochesterKnighthawks.net. Ohsweken Speedway’s 18th season of racing continues this Friday, August 9 when the Rochester Knighthawks present “Art Hill Memorial Night”, featuring the Corr/Pak Merchandising Sprints, Affordable Towing & Recovery Thunder Stocks, HRW Automotive Mini Stocks in the annual “Art Hill Memorial 42”, and Gale’s Auto Aftermarket Bombers, plus the rescheduled Thunder Stock B-Main and Feature from July 19. Weekly Friday night racing at Ohsweken offers affordable, exciting, family entertainment just a short drive from many Mid-Western Ontario locations. Weekly Friday night racing adult general admission is just $12, while admission for seniors and students is $10, and kids age 12 and under are admitted FREE! Spectator gates open @ 6:00pm, with the first race taking the green flag at 7:30pm this Friday, August 9! 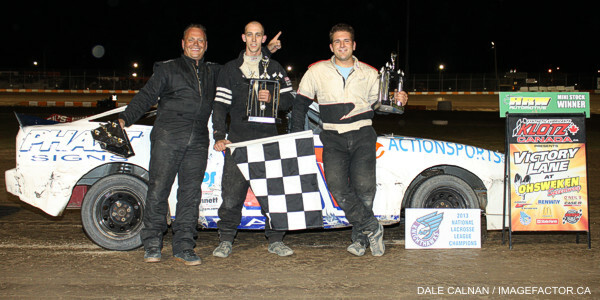 Visit the new official Ohsweken Speedway website at www.OhswekenSpeedway.com and Feel The Excitement!